More and more women are looking for natural hot flash relief or "home remedies" for hot flashes. For many years the treatment of choice was hormone replacement therapy (HRT), but the medical community has now identified the risks associated with long-term use of HRT. Since some women begin to suffer from hot flashes, bed sweats and other menopausal symptoms five or six years before their menstrual cycles end and then may continue to have them for several years afterwards, it is not unusual for a woman to need relief or treatment for ten years. The longer she uses HRT, the greater her risk of developing serious medical conditions including cancer, heart disease, blood clots and stroke. 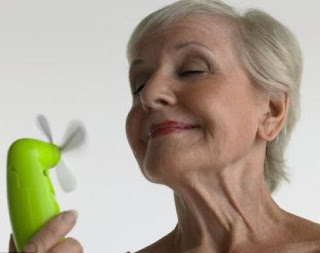 There are several types of home remedies for hot flashes. There are the things that you avoid, because they may trigger hot flashes or worsen their severity. There are the things that you can do to relieve or possibly prevent the frequency of them. And then there are herbs, botanicals and even some foods that may provide hot flash relief. First, we'll look at the things that typically trigger hot flashes; those things to be avoided. Caffeine and nicotine are stimulants. Stimulants increase blood pressure and cause blood vessels to dilate. One of the body's natural reactions to stimulants is "flushing". While decreased estrogen production causes hot flashes or "flushes" during perimenopause, menopause and post-menopause, anything that would ordinarily cause flushing, can trigger hot flashes. Even though alcohol is a depressant, rather than a stimulant, it still dilates the blood vessels, increases blood pressure and can trigger hot flashes. Other hot flash triggers may be unique to the individual woman and may require a symptoms diary to identify them. For example, many women find that spicy foods trigger hot flashes. Certain vitamins, over the counter drugs, prescription and illicit drugs (like marijuana) may trigger hot flashes, if they increase blood pressure or cause the blood vessels to dilate. When drugs or vitamins are necessary for other health reasons, it may not be possible to avoid them. Herbal home remedies for hot flashes may be helpful, in these cases, but prescription drugs can interact with some herbs. Your doctor, pharmacist or herbalist should be able to advise you about any herbal remedies that should be avoided, if you are taking medication. Hot flash relief may be a simple matter of wearing loose fitting, lighter weight or cotton clothing. Cotton allows perspiration to evaporate, cooling the skin off more quickly and making you feel more comfortable. Dressing in layers can also help. You can take layers off as your body heats up and put them back on, if you become chilled afterwards, as many women do. Regular exercise provides hot flash relief for many women. It may be that the heat you generate while moving around helps the body stay at a more comfortable temperature throughout the day. Diet can also be a factor, which brings up the last of the home remedies for hot flashes. A lot is being said about soy beans for menopausal symptoms. Soy beans contain a compound called isoflavones, which are plant estrogens or phytoestrogens. These phytoestrogens may have an estrogen-like effect on a woman's body, provide hot flash relief and possibly relieve other menopausal symptoms. While some experts suggest that adding soy to the diet may be a better choice than dietary supplements that contain the active compound, the research conducted thus far indicates that dietary supplements decrease hot flashes much more effectively than food products such as soy flour. For women who are allergic to soy, isoflavones can be found in other plants, such as red clover. Black cohosh is one of the most popular home remedies for hot flashes. Researchers have found it to be even more effective than soy isoflavones. Sarsaparilla is an ancient remedy for hormonal imbalances and may provide hot flash relief. Ginseng is effective for some women, not for others. Chasteberry, although often recommended, does not appear to reduce hot flashes, but can be helpful for other menopausal symptoms. Wild yam is sometimes recommended because it contains a compound that can be used to create synthetic hormones. Dong Quai root is another one of the home remedies for hot flashes, but some scientific studies have found that it is ineffective for hot flash relief, though it may improve other symptoms.